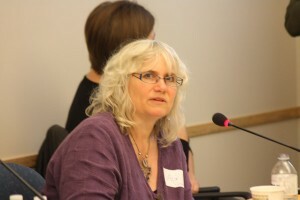 On October 22, 2011, BC Hands & Voices held its 3rd annual Fall Workshop at BC Family Hearing Resource Society in Surrey. It was an honour to have Angela Clancy, Executive Director of the Family Support Institute, lead the workshop. The focus this year was on the brothers and sisters of our children with hearing loss. Parents listened to a presentation and took part in discussions on how to build healthy sibling relationships within their families and meet each child’s own unique needs. Angela shared with the group some valuable insights into sibling dynamics and offered practical tips to employ at home. She included endearing personal anecdotes about her own experiences, growing up with a brother who has special needs. Two “seasoned” parents, April Cowley and Anja Rosenke, were each invited to speak of their journey in raising their children when one is deaf or hard of hearing. Throughout the day, attendees joined in the dialogue by sharing their own colourful stories with the group, which complimented the subject material presented by Angela. The opportunity to learn from Angela Clancy as well as from other parents that day proved to be an empowering combination for all. Setting the stage for the day’s discussions, Angela began with the idea of becoming travellers to each other’s worlds and to utilize this perspective in communicating. For example, I must be sensitive not to impose “my world” when I’m visiting “your world”. There will be time to visit “my world” afterwards. It was a strong message and a positive one, establishing how important it is to honour and respect each person’s viewpoint and ideas. Upon this premise we can teach our children to tell their stories and talk about their feelings, thus opening up the channels of communication and strengthening relationships. Along those same lines, the concept of active listening was a common thread throughout the day’s talks, as listening is the first step to establishing communication. Clancy spoke of being “physically present”, demonstrating body language that is open and accepting, being attentive and hearing the person out. As parents, it is important not only to model this ourselves, but to teach our children these important social skills as well. Helping our children become proficient communicators first means teaching them to hear each other, and naturally age appropriate approaches need to be considered. One parent suggested the “Bug and Wand” technique whereby the children face each other and take turns telling the other “It bugs me when (you do such and such)”, followed by “I wish (you would…)”. A simple and visually strong technique, I have already found success in prompting my 4- and 6-year-old children to use it at home! Angela also touched upon some of the concerns that brothers and sisters may internalize as siblings to a child with a disability, such as embarrassment, a sense of isolation, resentment, an obligation to care-give and worry about the future. Again, the idea of building strong open lines of communication with the siblings to address and work through such feelings is imperative. As parents, we need to provide a safe environment for siblings to open up about negative feelings or to ask tough questions about their brother or sister’s disability. In other words, if the sibling feels embarrassed and “wishes their little brother wasn’t deaf”, our role is integral to expelling the guilt or fear from these thoughts and make it ok for siblings to air their feelings. Clancy stressed that families should keep having conversations so resentment doesn’t build. Having said that, she also pointed out that we should explain to our children that while it’s ok to be mad at your brother/sister, it’s not ok to say mean things or to blame the disability. That is something that he/she cannot change. It’s a non-negotiable and teaching respect between siblings is key. Another issue that came up was the role that brothers and sisters often play in translating for their Deaf/HoH sibling. Sometimes they do it out of necessity, but in other cases the sibling instinctively takes on this responsibility. Angela spoke from personal experience when she added that this can be a lot of pressure for a child to assume. She suggested that families “bring others into the circle” by teaching those who interact with your Deaf/HoH child – even extended family members – some of the main signs your child uses, and if speech isn’t intelligible, what certain sounds or phrases represent. Clancy recommended we give the sibling a choice in how much and in what fashion they want to participate, but not to impose expectations. This too is an ongoing conversation to have. Some of the other take-away ideas Angela presented centered around conflict resolution and problem-solving between siblings – topics relevant to any familial household on any given day. These included reminders for parents to set clear expectations surrounding acceptable behaviour, to give consequences and ensure follow-through. Involving your children in the process of setting ‘house rules’ or assigning chores can be powerful (what do you think is fair?). And finding solutions together means that children will not only feel involved, but also be accountable. Of course with any household decision-making or settling of disputes, parents should ensure that the Deaf/HoH child is included in the conversation. Sometimes, this calls for restructuring the environment so that information is accessible to that child. First and foremost, have them be present. Take steps to provide the information at their level of understanding. Employing visual aids like a calendar, a flow chart with pictures or an experience book about `Yes/No Behaviour’ can be highly effective. When children face disagreement, Clancy cautioned against stepping in too soon and stressed the value in allowing children to learn to work through their differences independently. Several times throughout the day, talks came back to the idea of treating the child with the disability ‘just like the others’; that is, levelling the playing field between siblings. Within reason of course, parents should try to suppress the impulse to protect or shelter the child with the disability at times and let them work it out for themselves. Studies have shown that siblings of children with disability often develop strong qualities of tolerance and compassion. They may be more certain about their own future goals – both personal and vocational. Children who grow up with a brother or sister who has special needs are often more aware of the consequences of prejudice and orient themselves towards humanitarian interests as adults. Certainly, they develop an increased understanding of others. And it all starts at home. Adopting an attitude of acceptance and pursuing it through open communication is clearly a foundation for building strong, trustful and positive relationships between siblings within the family. As parents, the task is ours – the opportunity is ours – to shape our home environment and guide our familial interactions to that end. A final thought to contemplate is a term that Angela mentioned that day: DIVERSABILITY over DISABILITY. We are more alike than different after all. Thank you to all the attendees, volunteers and board members who helped to make the day such a success. BC Hands & Voices also wishes to extend a big thank you to Angela Clancy for helping us navigate this part of our journey in raising our children. This entry was posted in Events, Featured, Newsletter - Feb 2012, Newsletters. Bookmark the permalink. Follow any comments here with the RSS feed for this post.